About - R-Cap Process Equipment, Inc.
R-CAP Process Equipment, Inc has been providing stainless steel process equipment solutions in Heat Transfer (heating and cooling), Mixing (high shear and low shear), Material Handling (dry & liquid) since 1990 to customers throughout the Midwest and extensively in Illinois , Indiana , Michigan , Wisconsin and Ohio . These range from the largest multi national corporations to the smallest startup business. 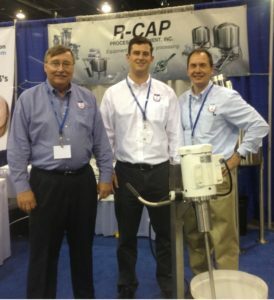 In 2005 R-CAP established a second sales office in Michigan to better serve our customers in that valuable market area. To be the first choice of our customers by bringing together innovative problem solving products and ideas that will provide a return on investment. Be a sustaining resource of information to our customers. We will act with integrity, use imagination for problem solving, work as a team and have a passion for what we do. To be a success and succeed in today’s market; we must do an excellent job everyday in managing the things we can control. We must also understand what the influence is of things beyond our control. Work to integrate both for a successful conclusion.